Project Seahorse is delighted to announce the launch of our new, improved iSeahorse.org website - our pioneering citizen engagement tool that gathers information about seahorses while building a community of committed contributors who are empowered to take action for seahorses and marine conservation. Anyone can join. Whether you’re a diver, fisher, scientist, or just on a beach holiday, you can share your seahorse observations with a click of a button. If you’ve seen a seahorse in the wild, join iSeahorse.org and upload your seahorse observations and photos. You can also help us identify species, explore maps, beautiful photos and fun seahorse facts, and take action for seahorse conservation. Since we launched iSeahorse in October 2013, scientists from Project Seahorse and around the world have used this vital information to better understand seahorse behaviour, species ranges, and the threats they face. Together, we use this knowledge to mobilize governments, policy makers, and ocean advocates to protect seahorses and the marine ecosystems they call home. To date, almost 500 contributors have shared their 2400+ seahorse observations, and we now have information on 30 of the 43 recognised seahorse species. The user-contributed observations on iSeahorse have also greatly expanded our knowledge of the known ranges of several seahorses - 15% of all iSeahorse observations are from outside of a species known geographic range! We are also learning much about the depth ranges and habitat preferences of the species observed, which will contribute to conservation planning efforts in the near future. We continue to build a strong community and alliance of citizen scientists, conservationists, experts and more, all working towards a common goal - to protect seahorses and expand our scientific knowledge of these mysterious and beautiful animals. There are now ten long-term seahorse population monitoring projects established on six continents (North America, South America, Africa, Europe, Asia and Australia) and we have more than 25 seahorse experts and enthusiasts from 16 countries participating as iSeahorse National Seahorse Experts and program Ambassadors. 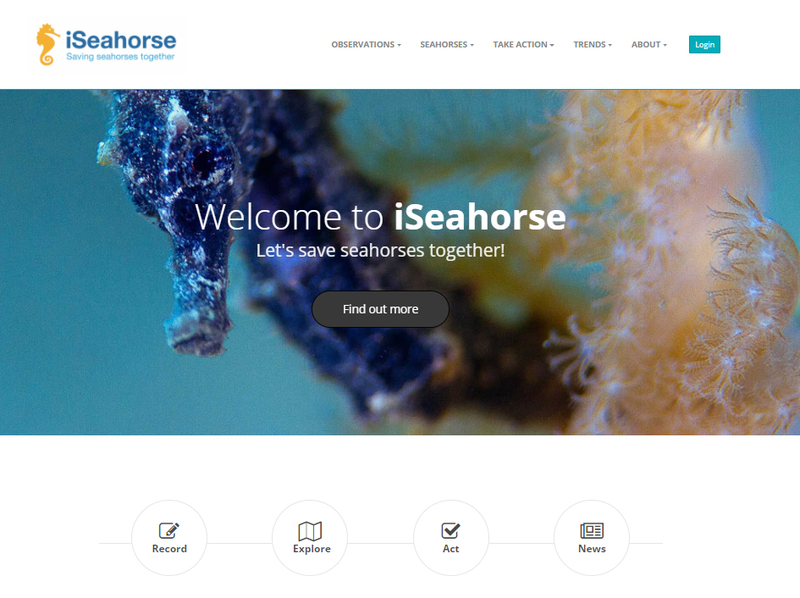 iSeahorse empowers users to take action and generate conservation change. In fact, a newly created 70 ha Marine Protected Area and seahorse sanctuary in Anda, Bohol, Philippines resulted from recently discovered seahorse populations reported through iSeahorse. To learn more about iSeahorse and seahorses, and to get involved, visit iseahorse.org.